Poland – At the 26th Economic Forum in Krynica, where Jaroslaw Kaczynski and Viktor Orbán called for counter-cultural revolution in Europe, the close links between the PiS and Fidesz party currently in power in Poland and Hungary were particularly emphasized, and the Polish conservative government took the opportunity to explain its economic policy which has been based in part on the policy in Hungary since 2010. 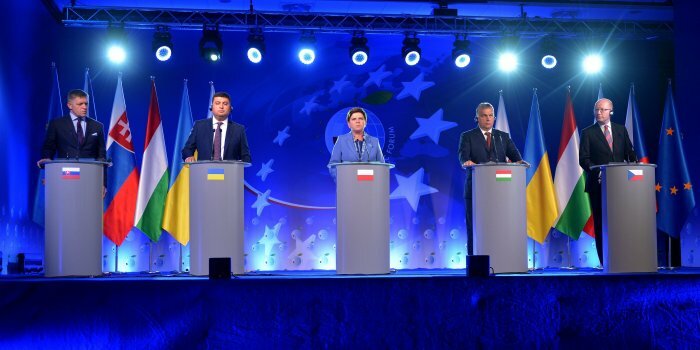 Like Hungary before her, Poland will, by economic patriotism policy claimed in Krynica by Prime Minister Beata Szydło, avoid pitfalls facing today most of the former Eastern European countries. The first trap is the “middle income trap”, that is to say the risk of a weak long-term growth to catch up with the economic level of the old Western Europe overall still twice as high 26 years after the fall of communist regimes. The second trap is the excessive weight of foreign capital in Poland is responsible for 50% of industrial production and holds 65% of the banking sector. This causes including a transfer of profits abroad in the amount of 5% of GDP annually. To rectify the situation, the Morawiecki plan, the name of the current minister of the Polish Development, wants to break, as did Hungary before it (which saved hher from sharing the fate of Greece) with the Washington Consensus that wants countries to be open without reservation to international trade and foreign capital and that the state should sell the private sector all the ways of production, which of course go in the hands of foreign capital. On the contrary, the Polish state will actively support the re-industrialization of the country by concentrating its support in the branches where Poland can gain a competitive advantage, such as aerospace, automotive, shipbuilding, chemical and food processing, and the manufacture of furniture and the information technology sector and communication. This is more than the equivalent of 200 billion euros that Poland plans to invest in the coming years to support activity and innovation in the industry, and half of these funds come from European subsidies. However not sure whether that the big German and French groups will like it because they prefer to see Poland and other countries in the region as cheap construction and consumption centers of their products rather than as serious competitors in international markets. The new Polish economic patriotism probably explains in part the additional taxes on the retail and banking, in the hands of foreign capital, the attacks on the government and Beata Szydło as before her the government of Viktor Orbán in Hungary. But in the eyes of the current Polish government, which has probably not wrong in the EU “achievement at any cost og the special interests of states and big business” comes before “cooperation ideas, market common and economic unification “, in the words of the Minister of Treasury Polish Dawid Jackiewicz in Krynica. For the Prime Minister Beata Szydło, economic patriotism is the promotion of Poland’s economy and industry.